A new fishing buddy of mine who I met on the Deerfield last weekend was cool enough to turn me on to a great Hex spot of his. 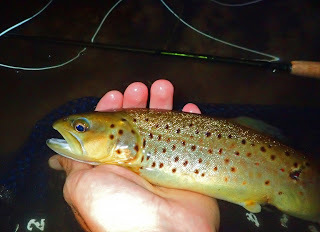 Out of courtesy to him I won’t divulge his secret spot in this post but there are several rivers here in Mass and adjacent states that have good Hex hatches this time of year. Think slow, silty stretches where the burrowing nymphs of these mayflies can live out there aquatic life stages. 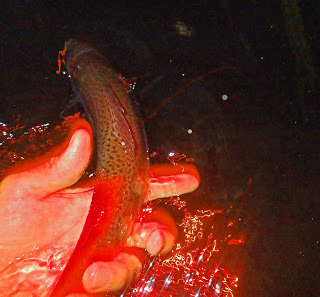 We went out on Monday night and I went back to fish the hatch again last night by myself. This post will be about both nights. The spot in question is only reachable by canoe or kayak. The Hex hatch usually starts popping just about dark so it is advantageous to scope out an area and be in position while it is still light out. 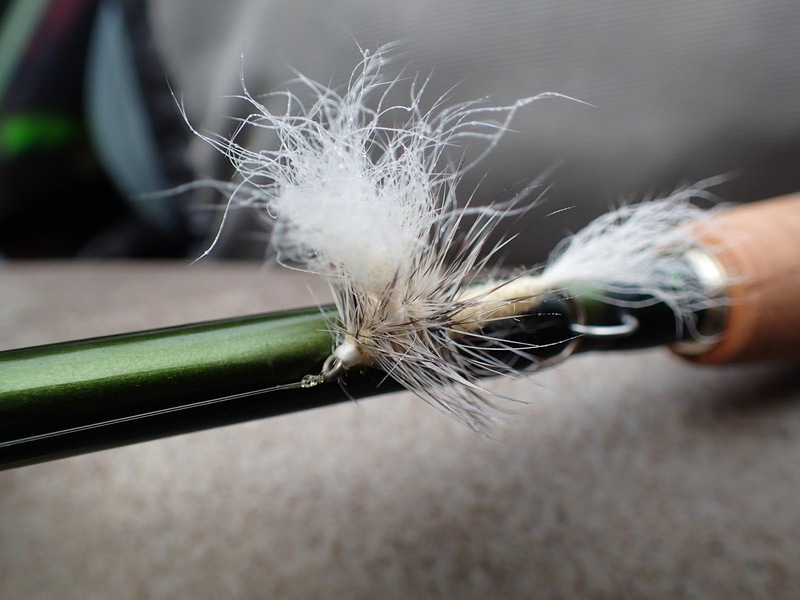 Fishing a nymph prior to the hatch sometimes work. The nymphs are active swimmers. 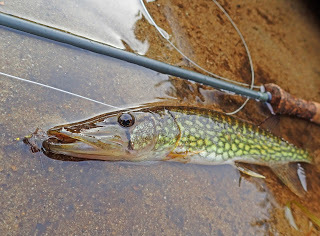 The first night we went out I tried the nymph for a bit and caught a largemouth bass, a yellow perch, and a cool little chain pickerel. The Hex hatch is a lot of fun. These are going to be the largest flies you’ll run into by far in this part of the country. Every fish in the river tends to be looking up on good nights and there’s a really good chance to hook pigs on dry flies – which, let’s face it, the ultimate goal when fly fishing for trout. 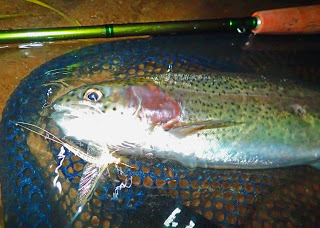 Although I’ve read and heard various reports concerning the timing of hatches and spinner falls of Hex, in this instance it seemed that duns came off right at dark for about 30 minutes or so and the spinner fall started about an hour after the fish quit rising to duns. This is just my observation over the last two nights however. I have a feeling that I didn’t stay out quite late enough to catch the full effect of the spinner fall. Monday and Wednesday were both work nights so I had to leave the river by about 11 to be home and in bed by 12:30 am. 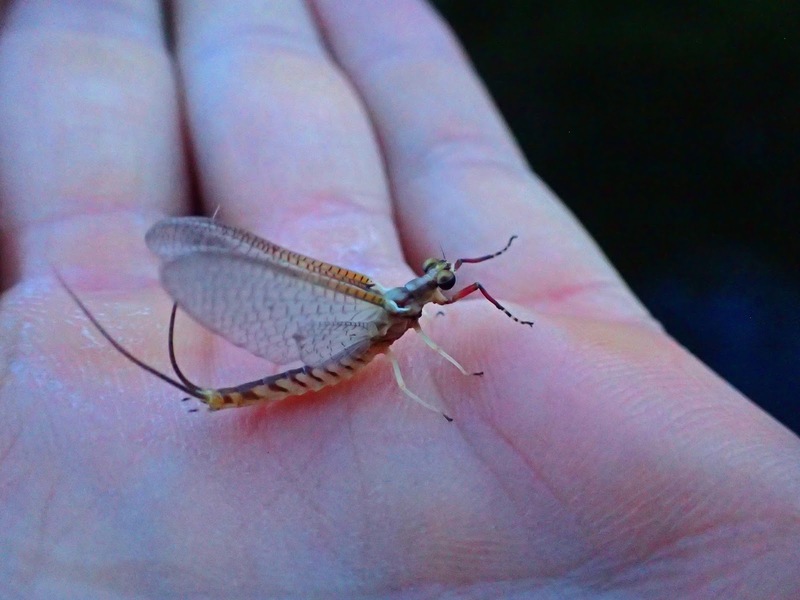 It is definitely an interesting experience fishing at night with dry flies. 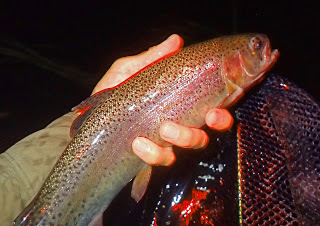 The hatch itself isn’t terribly hard because you are bombarded with splashy rises and it’s relatively easy to find fish willing to come up and take your fly. It takes some practice to react and set the hook based on the sound of the rise and your perception of where your artificial is in relation to the rise. If I had to guess my hookup rate probably dropped to less than 50% but I still managed to land several fish each night. Not the hogs I was wishing for but solid fish. As a side note, my night photography skills are pretty feeble so the pictures are not the best. I did get a few interesting shots though with the strange lighting conditions. Notice the Hex spinner next to the rainbow’s mouth in the third picture down. I did best during the hatch. The spinner fall can be excellent but it is much more difficult to pinpoint fish. Like all spinner falls, the trout’s rise form is very subtle and easy to miss if you can’t see it (which is the case after dark). A good set of ears is paramount. An added difficulty is that the trout tend to sit in one spot and leisurely sip the spinners that come down the current. They won’t move much so you’ll have to be pretty accurate with your presentation. I ended up getting only a couple during the spinner fall. I lost one that really felt like a heavy fish but I suppose that’s always the case with the fish that get away. It’s really fun to be on the river around dusk and after dark. I saw a fisher climb up and down two trees only 30-40 yards away from me. I assume he was looking for an easy meal of birds settling in to their roosts for the night. We heard screech owls calling to each other through the swamp. Beavers were everywhere and, at night, bold enough to slap the water so close to your kayak that the wake and surprise almost knock you over. The mosquitoes were epically terrible. I haven’t worn bug spray since about 2003. I like to think of myself as determined, most people would call it stubborn, but either way I got it in my head that I could develop a mental immunity to obnoxious insects. It’s been mostly successful but there are some times that test my patience – last night especially was one of those instances. I still won though considering the amount of mosquito carcasses that littered the river while I made it home unscathed. Sounds like a blast. Hex's are amazing and when you can get on a hatch it's super. Be it Bass or trout or other species… I think all fish like such big food choices! I'm with you on the mental immunity… but times like that, I'd break out the thermacell. Probably horrible for me, but works super well so long as the wind is slow to nil.